This page created 19th September 2013 using Notepad, by Ian Smith. London Transport did not buy its own Leyland Lion single deckers, but did acquire a few at its inception through takeovers. Associated Coaches was one of a number of companies competing to provide a coach service from Ongar and Epping to London (Liverpool Street/Bishopsgate), gradually winning out over its competition. Its vehicles included a triplet of coach-bodied Lions. It was taken over by Green Line coaches in March 1932 and the coaches were numbered L1-L3 in the Green Line series. London Transport duly took them over in July 1933. They were old-fashioned compared with the Regals, Leyland Tigers and Gilfords widely used by Green Line, and were put out to grass as soon as possible, being sold along with all the other Lions in 1936 when LT took delivery of its new Q buses. The major railway companies had their own fleets of buses to service their stations, the LMSR being no exception. 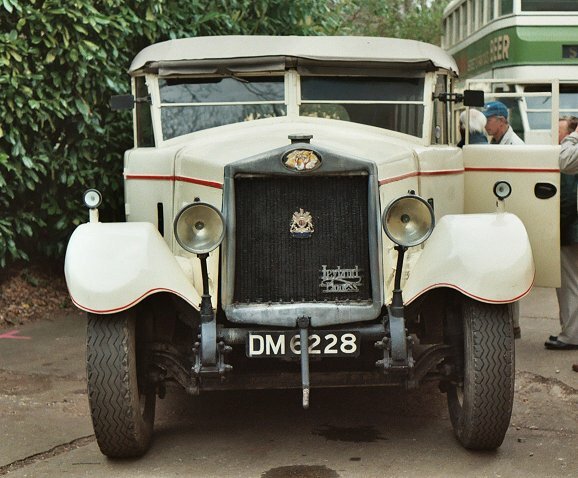 They had a sizeable fleet of Leyland Lions in the Tring and Hemel Hempstead area, most with bodywork built in the railway company shops at Derby. They operated Boxmoor - Harpenden and Tring Town - Tring Stn / Albury. This fleet of eight Lions, plus their routes, was acquired by London General Country Services in April 1932, and passed on to London Transport in July 1933. Most, if not all, were sent to Northfleet in a bid to concentrate types in particular locations. Northfleet, with a sizeable fleet of Titans from Maidstone & District, was used to Leylands. They put them to use on the 497 (Dover Road Schools - Gypsy Corner). They were repainted into East Surrey red/white, and then into LT green and black. Some had very upright front windscreens, some had a raked-back screen. They too were displaced by April 1936 as London Transport modernised its fleets with Q-types. The Leyland PLSC3 Lion, along with the Dennis E, had been a staple single-decker for London Independents. With the low level of fares and fierce competition in the Central Area only big single-deckers had a hope of making money, and the stretched Lion (16ft 5in wheelbase) was capable of taking a 26foot long body, seating 32. The Rotherhithe Area had a single-decker Independent niche in the shape of route 202 (Rotherhithe - New Cross), which served a great many factories and homes in an area dominated by the long viaducts of the railways into London Bridge, with an especially low bridge in Trundleys Road where the Bricklayers Arms goods line decended from the viaduct. Independents G.H.Allitt & Sons and R.Hawkins & Co (Nil Desperandum) started the route in 1929, which Bassom numbered into the Independents series as 202. So when London Transport took over in 1933 they kept the incumbent Lions (LN1-6) on it, operating from Old Kent Road Garage. The buses included one from G.H.Allitt, three from Nil Desperandum, one from Peraeque, and one from Empress Motors of Bethnal Green (who had earned more from their garage journeys than actually on route on the 202). The others, (LN7-11), three from Reliance of Chingford, one from Powell & Whybrow (Romford) and one from Prince Omnibus of Edmonton, some at least of which had operated on the 551 (Edmonton - Wheststone) seem to have been very quickly withdrawn, probably without further use. The 1934 renumbering kept the Rotherhithe route as the 202, as it now fell into the lower-than-double-decker category. New 5Q5s took over in May 1936. 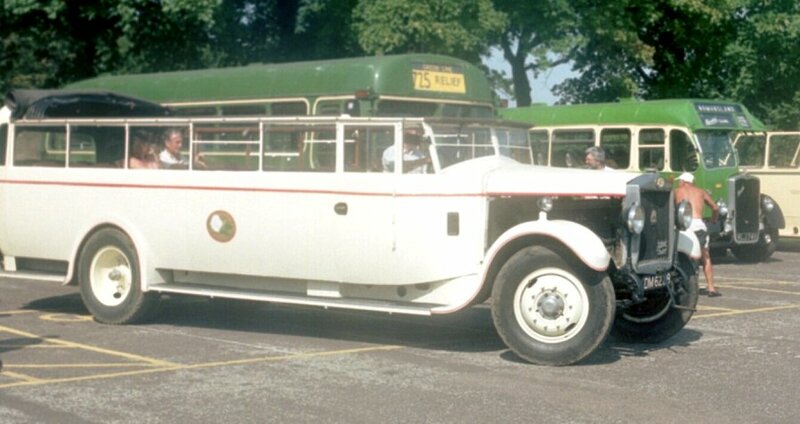 The Watford Omnibus Company sold out to London General Country Services just a month before LT came into being, continuing as a separate company until the takeover in July 1933. Amongst other buses it brought a pair of Lions to London Transport. These, like the Central Area Lions, had Dodson bodies, although with windscreens. Strangest perhaps, and unique in the London Transport fleet, was the normal control 20-seater Lioness bus that came from Harris of Grays. This was transferred south of the river to Northfleet. It found a home working the 499 route between Dartford and Farningham. Sold when only five years old, it went on to a career with at least two coach operators. Strangely, another Lioness has been seen in Gravesend. Preserved DM6228, in convertible coach format, and NOT the London Transport Lioness, visited the Gravesend Bus Running Days in 2003 and 2006. It serves to illustrate the massive sense of power that the type emanates. Birch had a couple of Lions with its own bodywork, that they used on route 214 for a while when they were new. But before the London Transport takeover these two had been converted to coaches and renumbered, presumably for use alongside their three Lions with coach bodies. Where or what these were used for I know not, whether stage carriage services outside London or contract / private hire work, but they did not come to London Transport.